Hwacheon Machinery America, Inc. is revolutionizing the industry with its C1 Multi-Process Turning Center. 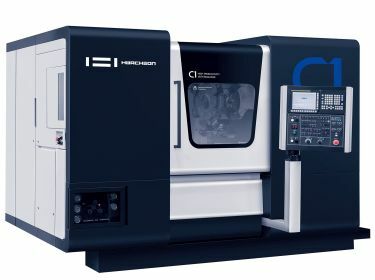 Half turning center, half machining center (Y- and C-axis control), the C1 can completely manufacture parts with complicated shapes in a single chucking operation. The C1 processes not only with ease, but also with maximum efficiency. Engineered with a triple stack turret with a tool changer, the C1 holds up to 36 tools and increases productivity. A multitude of tools allows for the precise machining of complex parts with drastically reduced setups, enables multiple jobs to be tooled up and is ideal for short run jobs. The C1 is also engineered for accuracy. Designed to minimize thermal displacement, the arrangement of units in the heat-symmetrical structure provides superior thermal stability. Hwacheon's original cooling system ensures that the rotary tool module inside the turret maintains exceptional processing quality, even during prolonged operation. In addition, the C1's independent orthogonal structure of X, Y and Z-axes reduces feed error to zero for high rigidity and precision, even during prolonged processing.